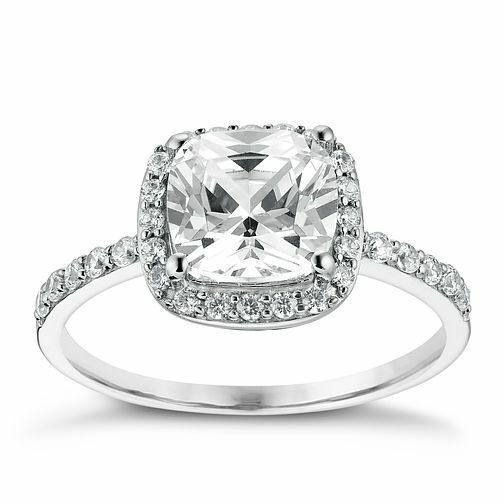 Strikingly beautiful, this luxury ring features a cushion set cubic zirconia on a sleek 9ct white gold band. Designed to stand out, this piece is perfect as an engagement ring to symbolise your forever promise, and equally as charming as an everyday accessory. 9ct White Gold Cushion Cut Cubic Zirconia Halo Ring is rated 5.0 out of 5 by 2. Rated 5 out of 5 by Anonymous from Over the moon I purchased my product for a surprise engagement and when i eventually built up the courage to ask my partner burst into tears of happiness. When she realised i had the gorgeous ring in my hand a second outburst came along. Shes absolutely loving her new ring. I often look over at her while in the house and 90% of the time shes staring at the ring while fiddling with it with a huge smile. I have never mentioned i keep catching her do it in case i spoil any of this happiness. Thank you so much for making my wife to be so happy. I will be using you again for wedding ring without a doubt. Kind regards Lea. Rated 5 out of 5 by Anonymous from Beautiful ring - so many compliments! I love the vintage look and although when the ring arrived I was surprised by how light (in weight) it was and by the very thin band - and thought it might look a bit cheap and obviously CZ not diamond - it looks great when worn as neither is obvious. I've had numerous compliments from (female) friends and colleagues since receiving a few weeks ago.